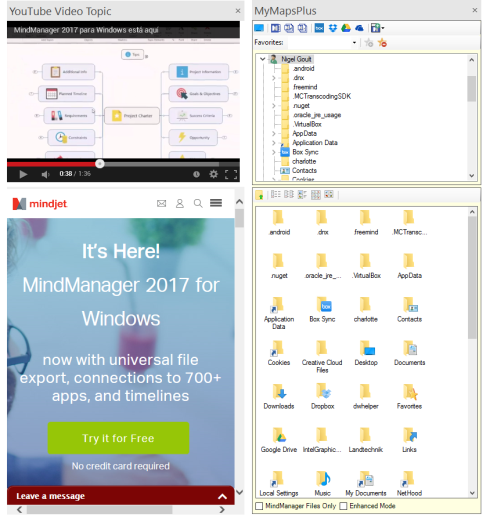 We are pleased to announce the latest edition of MAP for MindManager, our flagship add-in that now provides more than 50 additional functionalities. Continue reading to learn more about the MAP 3.0. The new version of MAP includes user interface changes, two new functions as well as some minor improvements and code changes to increase stability and performance. MAP 3.0 is the next major update of our flagship MindManager add-in. This update includes some fundamental changes in the MAP user interface with the addition of support for Dual Ribbon Menus, the removal of the old Quick Launch feature, the introduction of a new Favourites feature and small changes to application forms/dialogs to help support higher resolution displays. The introduction of an optional Dual Ribbon menu enables users to split the display of MAP commands across two Ribbon Menus. 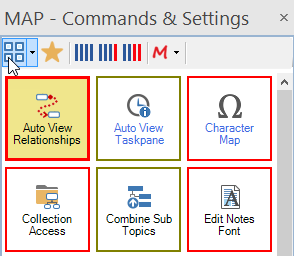 The MAP (Actions) Ribbon Menu contains the Map Action and Topic Action command groups while the MAP (Main) Ribbon Menu contains the remaining command groups. This enables users to have more commands displayed at full size and makes it easier to find commands quickly when using lower resolution displays. Of course, all commands are available via the MAP Taskpane as before. 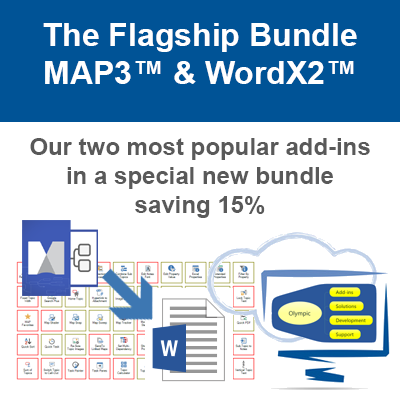 MAP 3.0 introduces two new functions; MyMapsPlus and YouTube Video Topics. YouTube Video Topics are a new Topic Action feature that enables users to insert data into a Map Topic that can then display and play a YouTube video as well as supporting information through the YouTube Video Topic Taskpane. 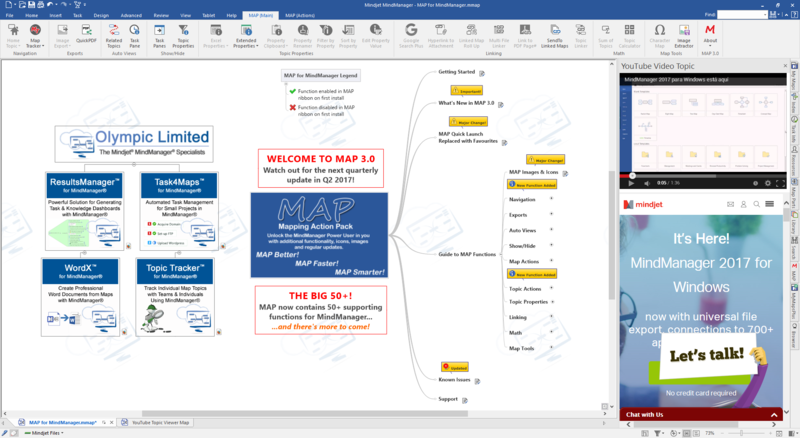 MAP contains over 50 additional functions for MindManager and continues to grow with each new version. Earlier versions of MAP included a Quick Launch feature located on the Home Ribbon Menu enabling you to add your favourite commands. This provided two-click/three-click access to commands you use on a frequent basis. 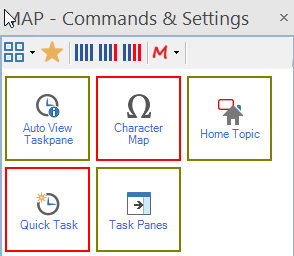 With the introduction of the MAP Taskpane in version 2.0, the need for this feature has now become redundant as the Taskpane provides two-click access to ALL Map commands. This has been updated to include a Favourites category enabling you to mark and display commands you use regularly in one grouping. The MAP Taskpane is used to access commands and settings for each MAP function. It is also used to choose which commands are visible in the MAP Ribbon Menu(s) and also which commands are selected as Favourites. Visibility and Favourite settings are changed via the Context Menu. Any commands you mark as Favourites can be viewed and accessed by clicking the Show Favourites Icon located on the MAP Taskpane Menu. This will then show you all Favourites in alphabetical order. Once selected, this view will be the default view when opening the MAP Taskpane for your current MindManager session. We have improved many of the MAP forms/dialogs to help support higher resolution displays and have replaced many Link Label commands with regular button commands for easier access and readability. This work is on-going and more improvements in this area will be rolled out with each point release of MAP 3. We are also trying to solve the issue of main commands having overlapping text on systems where scaling has been enabled. 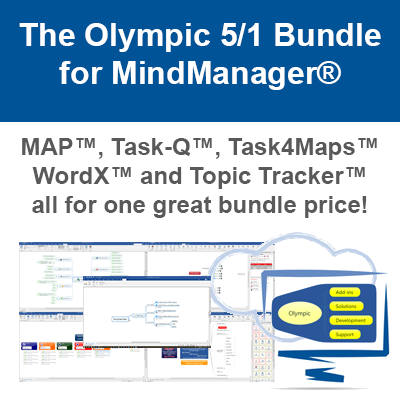 Purchase MAP for MindManager securely online.Contact us for pricing on multi-user licensing. We will be updating MAP regularly with new functionality and enhancements and we plan a 3.1 release in Q2 of this year.